It’s full steam ahead with baby-led weaning in my house right now! Our 6-month old twins Gus & Hannah just started solids and I’m documenting the sequence of their first 100 foods over on instagram @babyledweanteam. But I have to say, followers looking for strict baby-led weaning were were kind of surprised when I started posting pictures of them using a spoon. So what gives? Can - and should - spoons be a part of baby-led weaning? There’s not a lot of consensus as to what exactly constitutes baby-led weaning. 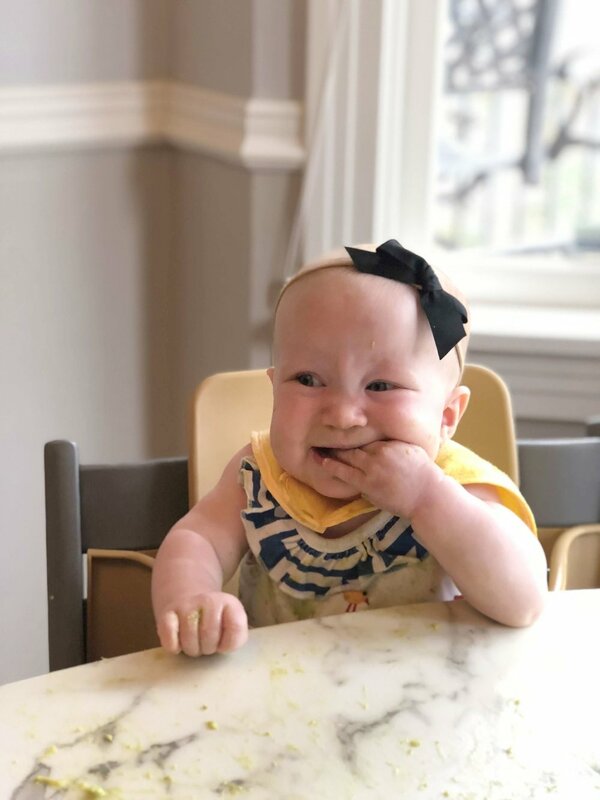 But those who embrace BLW will agree that “baby-led weaning” is an alternative to spoon-feeding purees as well as a feeding philosophy that promotes self-feeding by baby. “Baby-Led Weaning” is a modern term coined by the co-author of the Baby-Led Weaning Book, Dr. Gil Rapley; but, in practice it’s literally an ancient concept. Think about what cave mom did to feed cave baby food long before commercial, pureed baby food, pouches and spoons were around, right? As a baby-led weaning enthusiast and mom who has used this approach 6 of my 7 kids - and a dietitian, infant feeding specialists and college nutrition professor who has taught BLW to thousands of families and healthcare practitioners, I firmly agree that there’s almost no wrong way to feed your baby. There are many variations on baby-led weaning that one can adopt when starting solids with baby. Some families try to go right to the same table food the rest of the family is eating, while others start with soft cooked starter foods, and still others combine some purees with mostly solid foods. Some research papers have defined BLW as being about 90% self-feeding by baby, with 10% or less involving puree by spoon. I personally like this 90/10 rule, and from a safety standpoint, I prefer to front load my babies’ forays into solid food by involving some purees fed by spoon. “Oh, well then that is just spoon feeding and it’s traditional weaning” I hear the naysayers say. But it’s not…because with traditional weaning baby eats purees (and pretty much nothing else) for weeks or months on end. And here’s how you can make baby-led weaning work with spoons: pre-load your baby’s spoon and let baby spoon that puree by him or herself. Speech Language Pathologists who are trained in infant feeding generally don’t love a baby-led approach to starting solids. But for those who do embrace aspects of a self-feeding baby, they often recommend starting with thin puree, then thick puree and moving to lumpy puree to establish that the baby has a safe swallow. If there’s no excessive gagging or choking or other adverse events, then baby is likely ready to move on to new textures. How this differs from traditional weaning is that spoon-feeder parents tend to get STUCK on purees fed by spoon and stay there with baby for weeks or months. 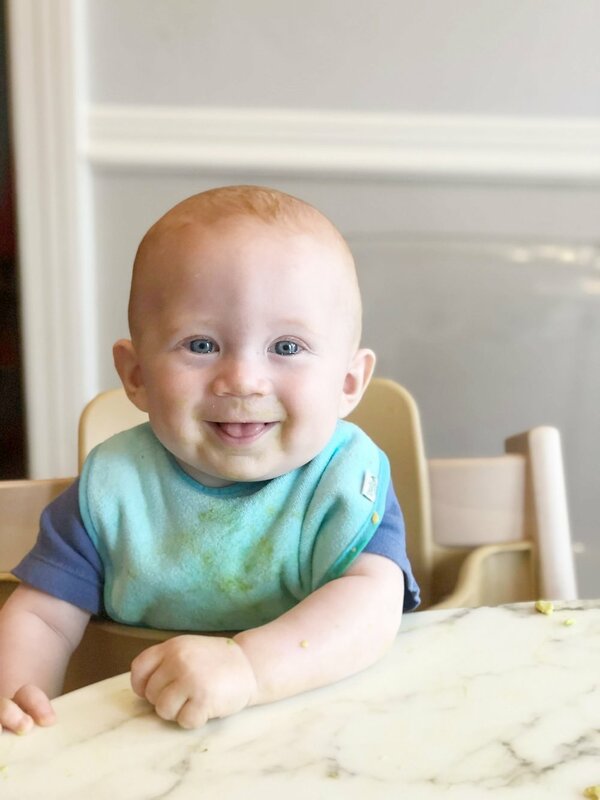 This approach under-estimates and under-utilizes baby’s ability to tolerate new textures and move quickly through new foods as they get the hang of eating solids after 6 months of age. Purees are still an important texture for babies to master - it just usually only takes days and not weeks or months for a healthy baby to get there. Putting purees on the spoon and letting baby self-feed (vs. parent putting the spoon in the baby’s mouth) is a very common way to incorporate spoons into a self-feeding routine. With my approach to BLW, I like to practice an approach I call “purees for a few days” whereby I’ll introduce a new eater to food with a thinned out puree version of a typical BLW starter food. A great example is avocado, which you can mash, thin with breastmilk or formula and then load onto a starter or baby spoon and let baby try to self-feed. This is also a great approach for foods that are naturally more of a puree than solid texture. Take full fat yogurt or applesauce for example. These foods generally benefit from being fed by spoon - and there’s no reason why your baby can’t do the self-feeding, even if it isn’t always with his or her fingers. Despite all of the baby feeding products available for sale, it’s a bit surprising that there aren’t a lot of great starter spoons out there. If the bowl of the spoon is too deep, baby might not have the facial muscle strength to extract the puree. All of the photos in this blog post were taken on the first day my 6 month (age-adjusted) twins Gus & Hannah began solid foods. I demonstrated how to bring spoon to mouth and they immediately got the hang of it and could do it too. Don’t underestimate your baby’s ability and desire to self feed. Just be there to guide and support and provide a safe feeding environment and you’ll be blown away by what your baby can do!